It seems as though my street art is generating some positive buzz in the community. Apparently the art has been discussed at a Vicksburg Village council meeting, It was written up in the local paper (shown above) and I've been approached by the Kalamazoo Gazette to be the focus of a feature article. I thought at some point I would be approached for some sort of news story. I didn't anticipate it happening as quick as it did. I’ve been a commercial artist for the last 10 years. I’ve been living in Vicksburg for nearly 3 years. I’ve created graphic design and illustration projects for clients such as Kellogg’s, Well’s Blue Bunny, Lender’s Bagels and the folks who brought you Moose Tracks ice cream to name a few. I‘m currently the Creative Director for RED 7 STUDIOS, a soon to be announced graphic design studio specializing in unique marketing approaches. RED 7 STUDIOS is also responsible for sponsoring much of my public art. Sammo is a derivative of my real name. I sign my art using Sammo because it provides a level of anonymity and creates a sense of mystery. Everybody loves a mystery. Mysteries engage people’s imagination and that’s what I seek to do with my public art. It all began when I came into ownership of 8 old books nobody wanted. Instead of throwing them away or donating them to the library I decided to come up with something unique to do with them. So I placed the 8 books under 8 different bridges on various river sections around Vicksburg (and a couple under the Centreville covered bridge). I tried to make the retrieval of these books only accessible by canoe or kayak. Inside each book I taped a note encouraging the finder to place the book at another river location of their choosing. But first they were encouraged to email me where they found it and attach a photo of where they placed it next. Then I'd post the results on my blog. The hope was these 8 books would make their way to some unique river locations (hopefully outside the Vicksburg area). So was born the River Read Experiment. Truthfully, I didn’t have high expectations for this experiment. I knew I was asking a lot from people to take a photo then send it to me. However, placing those books under bridges was certainly more fun than dropping them off at the library. "My cousins and I found 3 of you're books on the inlet river to portage lake. We found "The Photo Drama of Creation", "Kept for the Master", and 'Shepherd of the Hills". We found them on May 29, my birthday! We should of been at church. Well any way, we took one of your books home to Munster Indiana to put under a bridge. We live about an hour southeast of chicago. My other cousins are from AnnHarbor Michigan, my grandparents have a cottage on portage lake.We started there and went all the way to kimble lake. We put one of your books way up the river.I'm really sorry but we didn't have a camera take a picture of where we found them.We didn't read the whole book but we did read a few pages of them, there old. My mom and aunt thought that this was absolutly the coolest idea ever.We do ,too. We hope your projectes well. So after that initial experiment’s success, of which I thought would amount to nothing, I began thinking about other possibilities. Since I’m an artist, it was only natural to consider the possibility of leaving my art in easily accessible public places. So one evening, over the course of 2 hours, I sat down with a Sharpie marker and a stack of scrap paper and drew 60+ faces. I then printed labels with my email address and blog URL and affixed them to the back of each piece. The following day I took those 60 pieces of art and placed them around Centerville, Schoolcraft and Vicksburg. I admit placing art in public for the first time was pretty awkward. It does take some getting used to seeing your art blown to the ground by the wind and having people walk over it. It’s also awkward at first because you think everyone is “onto you”. Eventually that insecurity fades and you become more comfortable placing the art. Sometimes it’s actually fun to take a big 17”x34” piece of art and place it in full view of people. If you act like you belong, people won’t question you. I should mention I’m not about making political statements or engaging in subversive activity with my art. The “guerilla art” or “street art” I create is really for the enjoyment of others. In fact, some of my favorite places to put my art is at the outdoor break tables of local manufacturers. If I had to work in a factory environment doing the same thing day in and day out, finding a piece of art would be a bright spot. After my initial foray into placing public art in surrounding communities I decided to focus my artistic attention squarely on Vicksburg. I absolutely love Vicksburg. Having lived in the village for nearly three years there‘s no place I‘d rather be. Placing anonymous art around the village has been my way of encouraging people to look at their village with new eyes. It’s my desire to awaken people’s perceptions of how special Vicksburg is. That being said, placing my guerilla art is only the beginning. One project that is currently underway involves a limited edition photography booklet highlighting different aspects of Vicksburg. RED 7 STUDIOS will be proudly sponsoring the publication. As with the guerilla art, this booklet will also be placed in public places for people to find. People should keep their eyes open. You never know when these booklets will hit the streets. Right now it’s about implementing fun ideas, generating buzz and getting people to look at their community more closely. In time, I envision the art in public places concept evolving to include contributions of guest artists and photographers whose work I admire. In addition to art, I’d like to incorporate my interest in documentary “filmmaking” with alternative media driven projects. 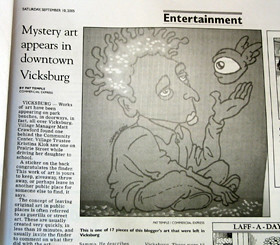 What that basically means is, instead of people finding drawings and paintings in public spaces they may find a limited edition DVD showcasing video profiles of interesting businesses in Vicksburg, interviews with unique local residents or maybe even a short film shot in Vicksburg. It’ll be projects like that, that I may need to lose my anonymity. But, for now I’m going to remain anonymous while showcasing how special Vicksburg is, using non-traditional methods. Art placed in heavy foot traffic areas doesn’t necessarily mean people will grab the art faster. It’s usually the opposite. I like to create art using different themes and styles. I don’t want people to tire of a single style. Plus it’s more fun for me. Faces tend to be the easiest and fastest to draw and paint. My art will at times be bizarre but it’s never intended to offend. I have never seen anyone take my art nor have I seen people’s reactions when they first see a piece. I will sometimes see my art hanging in a place of business though. I tend to place my art during daylight hours unless they’re large pieces. My characters tend not to smile because drawing teeth sometimes takes too long. At first I would spend max 2 minutes per drawing. Now I spend a max of 10 minutes per drawing. I like the results better. My 17”x34” cardboard paintings take between 20 minutes to an hour (per piece) to complete depending on complexity. The longest piece of art left unclaimed was 6 days. It was in a heavy foot traffic area and very obvious. I believe people respect each other’s property in the village to the point that they may be reluctant to take the art for themselves. I’m just guessing. The riskiest area I placed art was the Vicksburg Police Department. I didn’t want to have to explain what I was doing but, I felt they might like some art. I use the terms “guerilla art“, “street art” and “public art” interchangeably. I did receive an email from someone in Toronto calling my cardboard paintings "dropart". I found that term to be interesting. Rock on brother. sure I've said it b4, but I'm gonna say it again ... SO freack'n proud of you & absolutely amazed by you, I thank you'r God ( 'til I git one of my own) for helping you cast off you'r "shell". Go get 'em. Thanks man, for your sincerity. You've certainly seen enough of my life to make such a comment. Congratulations, Sam! Keep doing your thang. ...is now a good time for me to send you my resume or should I wait another day or two?? Diseased ... he's takin resume's? Never mentioned it to me. Seriously though, could you imagine the three of us sharin a studio - maybe we would actually do the " axel adams" piece. Axel Adams is a registered trademark of Sammo's Diseased Ink studio. Dude, don't be that way .. it's his blog, his name has to come first. Inkhead - send me your doodles. Keep em' clean. I don't want any trouble. Diseased - I got a stack of paper waiting to be tagged by you. Since you and the Inkhead have some twisted notions I should tell you too (keep em' clean) I don't want any trouble. I'd still have to live in town long after you two artistically pillage and plunder it. Dear sir, I am agast when have yoiu ever known me to draw anything that might be considered unfit for .. o.k. besides that time, yeah but that was a commission, oh that was just funny - you gotta admit THAT was funny. Dang, we have known one another awhile. Maybe I should stick 'round the jaded side of america.